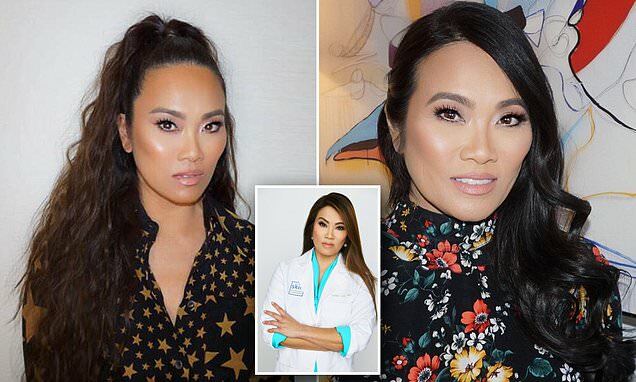 Dr. Pimple Popper is no stranger to being exposed to imperfect skin, as the dermatologist is best-known for performing extractions on people's skin and popping some of the most humongous zits that exist. And after her many years working in the skincare industry, Sandra Lee, a California-based dermatologist, has picked up a few tips, and some products that stand out to her as being exceptional among the massive sea of concoctions available. Now the 48-year-old skin expert has revealed her must-have products and skincare tips that she swears by, including wearing SPF every single day, and using non-comedogenic products that won't cause pores to become clogged. Sandra's first and foremost tip for ensuring your skin is in the best possible condition is SPF. 'If you are going to do one thing every single day, I ask that you please wear sunscreen. Your skin will thank you as this is truly the best way to prevent wrinkles and signs of aging on your skin,' she said. The dermatologist added that it is important to choose a broad-spectrum sunscreen, as this means the cream contains agents that will protect skin against UVA and UVB rays - both of which pose a serious threat to skin. She said: 'I suggest finding a moisturizer with SPF in it, so you can have one less step in the morning. 'You also want a two-in-one product that is non-comedogenic, meaning it won't clog pores and irritate or cause breakouts'. Next up in Sandra's list of skin must-haves is an exfoliating cleanser. Her skincare line, SLMD Skincare, features a Salicylic Acid Exfoliating Cleanser ($25) that Sandra says is a 'best-seller'.